Excuse us for living, but we the oldest of the Baby Boomers, born in 1946, have seen our country at its best. We grew up in the 1950’s and the 1960’s were our “coming of age” years. We have as the bookends of our lives the Great Depression and World War II on the one end and September 11, the Afghan and Iraq Wars and the Great Recession on the other end. 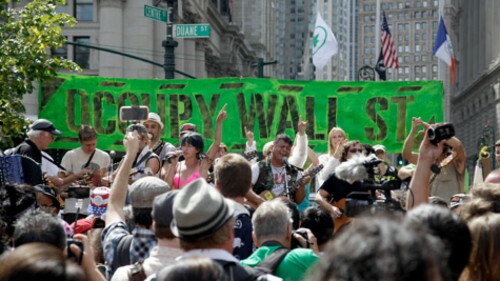 And what represents the future of America and where we are headed may just be hinted at in the Occupy protest movement. It is in that movement that we can see the frustrated outgrowth and result of America’s classes today and an emerging national emergency. 1. The blue-collar working class: 26 million, 20+ % of the work force (down from 50% in the 1950’s). 2. The service class: 60 million, 47% of the work force, the largest class and worst paid. – – food services, janitorial, childcare, eldercare, clerical and routine administrative. 3. The creative class: 40 million, 33% of the work force, earning 50% of all wages and salaries in the U.S., and controlling 70% of discretionary income. The author goes on to show us how it is the division of classes that shapes most aspects of our American daily life: red vs. blue states, Democrats vs. Republicans, liberals vs. conservatives, secular vs. faith based, smoking, obesity, fitness, dental care, gun violence. In essence, America’s deepening class divide affects every facet of our lives. It influences beyond wealth and health, but virtually what we think and believe. What Richard Florida is saying is not new and has been repeated throughout history and the ages. The most blatant example in the extreme is the French Revolution of 1789. It is replete with images of the radical Robespierre, the guillotine, the rise of the bourgeoisie or middle class, just to name a few. The most accurate term that describes the process is not one that endears many. It is the redistribution of wealth. The subject can be argued and fought over but its eventual triumph must emerge and always does. For, without the periodic redistribution of wealth the masses will not settle down so that society may go forward with economic productivity in an orderly fashion. VJ-Day, August 14, 1945, Times Square, New York City. 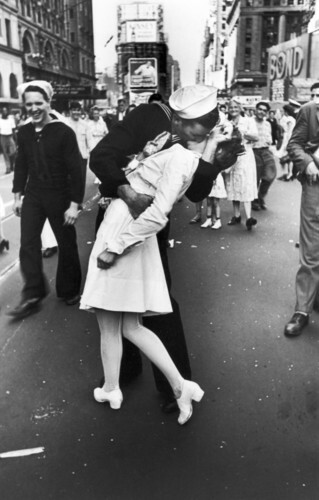 This is the famous photo by Alfred Eisenstaedt of the sailor & the white-clad young woman. Excuse us for living, but those of us Baby Boomers can give witness to our more civil redistribution of wealth in our lifetime. It was known informally as the G.I. Bill after World War II. Formally named the Servicemen’s Readjustment Act of 1944, it provided a range of benefits for returning World War II veterans. Benefits included low-cost mortgages, loans to start a business or farm, cash payments for tuition and living expenses to attend college, high school, or vocational education. By the end of the program in 1956, 2.2 million veterans used the G.I. Bill to attend college and 6.6 million more used the benefits for some kind of training. Thus, Americans were given a path to move up the ladder and into the middle class via the G.I. Bill. Richard Florida is right! We need a new policy, new legislation or a series of new laws, perhaps tied to some kind of national service, to lift Americans up and out of the lower classes and into the dreams of the middle class and upper middle class and beyond. May America find its way once again! Sources: Daily Record, a Gannett newspaper of Morris County, New Jersey, article by Richard Florida, September, 2012. I surely appreciate your use of history because often we know history repeats itself. A different class structure viewpoint is interesting and certainly has merit. All the discussion of education, jobs, skills in post-WWII is surely what we can use today, and I personally believe all this points to the need for tax reform. We’ve heard that for years, but I fear we have one do-nothing Congress after another. I suspect new leadership has at least a fair chance of getting something in tax reform accomplished. I also favor capitalism over socialism. We need growth and economic expansion as we had post-WWII and really, it’s all about jobs. One thing I don’t understand is the number of homeless who are veterans. When my uncle came back from the Vietnam War, he was extremely well taken care of by the military: four years of college on the GI Bill, low interest rates when he bought his home, car, boat, and RV, ongoing monthly payments from the government, and burial in a national cemetery when he died a few years ago. The monthly payments part is interesting. I have to presume that those stopped sometime in the distant past because his monthly payment would definitely be enough to live on, even here in San Diego. Phil, this one really strikes a cord for me. Redistribution of wealth can come in many forms from increasing worker wages to providing for a quality education all the way through college. These are just some of the things that can be done to improve the quality of life for the working man and make America great again. Unfortunately, time and time again our government shoots us in the foot as we have seen with the failure of trickle-down economics and the numerous trade agreements that have pushed our manufacturing base and jobs overseas. Let’s hope that the partisan bickering in Washington subsides before it is too late. By the way if you haven’t read it, The Crash of 2016 by Thom Hartmann is an excellent book discussing how we got to where we are today and what the likely result of it will be by revisiting America’s history.